You have achieved lots in your lifetime, mainly through hard work. 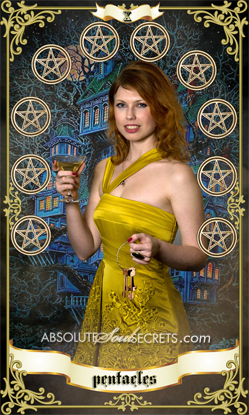 As the card suggests the women is dressed in gold and celebrating with a glass in her hand. The keys in her other hand suggest that there are still many doors to open and lots more success for you to come. The house in the background suggests you come from a strong and close knit family. You may be in line to inherit the family home, family business or property owned by your family. As part of your family ties you may care for an elderly parent or relative. This will not be a burden to you, you will comfortable in this role and are happy to repay them for the care they gave you when you were younger. Your relationships tend to be conventional and traditional. When you are ready for marriage, you are likely to have a “white” wedding in a church. As a couple you will provide a very stable and caring environment for your children. The 10 of Pentacles shows us that your relationships will be rock steady with a very secure foundation and last the distance. In your career a promotion may not be far away, your hard work has not gone unnoticed. You will rewarded for all your efforts.